NAGE National President David J. Holway is urging President Trump and Congress to come to an agreement, re-open the government, pass long-term spending bills that include a 1.9% pay raise for federal employees and back-pay for furloughed and unpaid workers. After funding expired on Friday, December 21, 2018, the fate of several federal government agencies remain in limbo as President Trump decided to partially shut down the government on December 22nd. As the government shutdown drags into its 13th day, 420,000 federal government employees are working without pay while 380,000 have been furloughed. 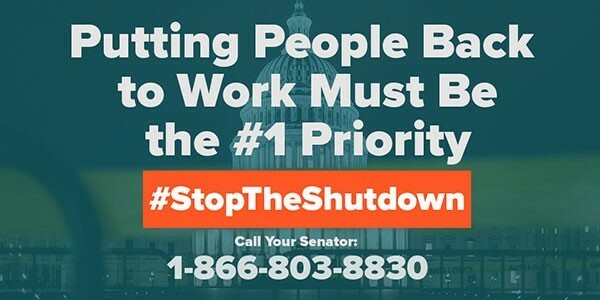 This third shutdown in a calendar year is disrupting work and pay for hundreds of thousands of federal workers. The fate of government operations is still unknown as President Trump refuses to sign a resolution that does not include $5 billion dollars to build a wall along the U.S.-Mexico border. In the midst of the government shutdown, President Trump signed an executive order Friday evening that would freeze pay for federal workers in 2019.